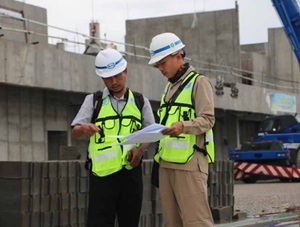 PT Wijaya Karya (Persero) Tbk - WIKA is a well-established state-owned general construction company in Indonesia. Together with its 7 directly-owned subsidiaries, WIKA has main business focus rests on 5 business pillars: Industry, Infrastructure and Building, Energy and Industrial Plant, Realty and Property, and Investments. WIKA's subsidiaries comprise of PT Wijaya Karya Rekayasa Konstruksi (90.04% owned by WIKA), PT Wijaya Karya Gedung (69.30%), PT Wijaya Karya Bitumen (99.00%), PT Wijaya Karya Serang Panimbang (80.00%), PT Wijaya Karya Beton (60.00%), PT Wijaya Karya Realty (90.88%), and PT Wijaya Karya Industri dan Konstruksi (97.22 %). WIKA was first established in 1960 as Perusahaan Negara Bangunan Widjaja Karja (PN Widjaja Karja) with principal business in the electrical, water pipe installation. Later in 1972, PN Widjaja Karja renamed into PT Wijaya Karya. WIKA is a public-listed company and its shares are listed on the Indonesia Stock Exchange (IDX) since 2007 under reference code WIKA. As of December 2017, WIKA is 65.05% owned by the Government of Indonesia and 34.95% by general public and investors. The financial performance of PT Wijaya Karya (Persero) Tbk in the business year of 2017 (ended in 31 December 2017) showed a good improvement. According to information found in PT Wijaya Karya (Persero) Annual Report 2017 as cited by JobsCDC.com, WIKA booked total net sales of Rp26.18 trillion in 2017. This total net sales is up 67.06% from Rp 15.67 trillion in 2016. WIKA successfully recorded a total asset of Rp 45.68 trillion, with a noticeable increase of 45.70% from Rp 31.35 trillion in 2016. S1 degree in Chemical Engineering. Required experience for minimum 8 years in oil and gas / industrial plant / smelter project. Familiar and able to provide input and review of Process Engineering Design Documentation. Technical experience in FEED, DED up to Construction, Commissioning and Start-Up. Familiar with International Engineering Code and Standards in the Process Engineering for Oil and Gas / Industrial Plant / Smelter. Skilled in operating process software ; Hysys, HTRI and Pipenet. Previous experience in site supervision. Willing to be assigned in Head Office and Site Project. Familiar and able to provide input and review of Process Safety Engineering Design Documents. Familiar with International Engineering Code and Standards in the Process Safety Engineering for Oil and Gas / Industrial Plant / Smelter. Skilled in operating process safety software ; PHAST, Flarenet, Flaresim and Pipenet. Required experience for minimum 3-5 years or involved in 1 full EPC project in (DED, Construction, Commissioning and Start-Up phases), both Oil and Gas / Industrial Plant / Smelter. Familiar and able to provide input and review of Process Engineering Design Documents. Familiar with International Engineering Code and Standards in the Process Engineering for Oil & Gas / Industrial Plant / Smelter. Familiar with International Engineering Code and Standards in the Process Safety Engineering for Oil & Gas / Industrial Plant / Smelter. Skilled in operating process safety software ; PHAST, Flaret, Flaresim and Pipenet. Required experience for minimum 0-1 year or involved in 1 full EPC project in (DED, Construction, Commissioning and Start-Up phases), both Oil and Gas / Industrial Plant / Smelter. Familiar and able to provide input and review of Process Engineering Design Documents or Process Safety Engineering Design. Familiar with International Engineering Code and Standards in the Process Engineering or Process Safety Engineering for Oil & Gas / Industrial Plant / Smelter. Skilled in operating process or process safety software ; Hysis. Required experience for minimum 2-8 years as a Process or Piping Drafter. Skilled in operating 2D AutoCAD, preferably 3D. Preferably experienced in developing a valve image, pipe tank, conveyor, ducting, and mastery its terms. Able to work quickly and precisely. JobsCDC.com now available on android device. Download now on Google Play here. Please be aware of recruitment fraud. The entire stage of this selection process is free of charge. PT Wijaya Karya (Persero) Tbk - Fresh Graduate, Experienced Dept Industrial Plant WIKA November 2018 will never ask for fees or upfront payments for any purposes during the recruitment process such as transportation and accommodation.